USDCAD rebounded to a 10-day high of 1.3220 from a 1.3063 low that was seen on a by-CAD reaction to the BoC’s 25 bp interest rate hike and guidance for tighter monetary policy to keep inflation near target. However, the statement also emphasized a “gradual approach, guided by data.” A 4%-plus dive in oil prices, as Libya announced recommencing supply, subsequently prompted selling of Canadian dollars, given the sensitivity of Canada’s terms of trade position to crude prices. USDCAD has support at 1.3150-53. WTI crude oil futures has plunged better than $2.50/bbl, or nearly 4%, from post EIA highs of $72.04, so far bottoming at $70.01, a 2-week low. The tumble has come despite the large inventory draw reported earlier. News that Libya has re-opened its ports and will begin exporting again has been the biggest weight on the contract, while talk of Trump pushing Putin to increase production when they meet next week has been a factor as well. Hence, the extremely big body bearish daily candle formed yesterday makes the bullish outlook improbable. The price movement since 70.01 low managed to stay within the 70 area, consolidation since morning around the condluence of the 20-Day MA and the 38.2% Fibonacci retracement set since June 18. Daily momentum indicators present a small negative bias in the near future however in longterm they remain on the bullish scenario so far. Daily RSI slipped lower to 50 and has currently flattened at neutral zone suggesting consolidation intraday. MACD oscillators decreased below signal line but remain well above the zero line. 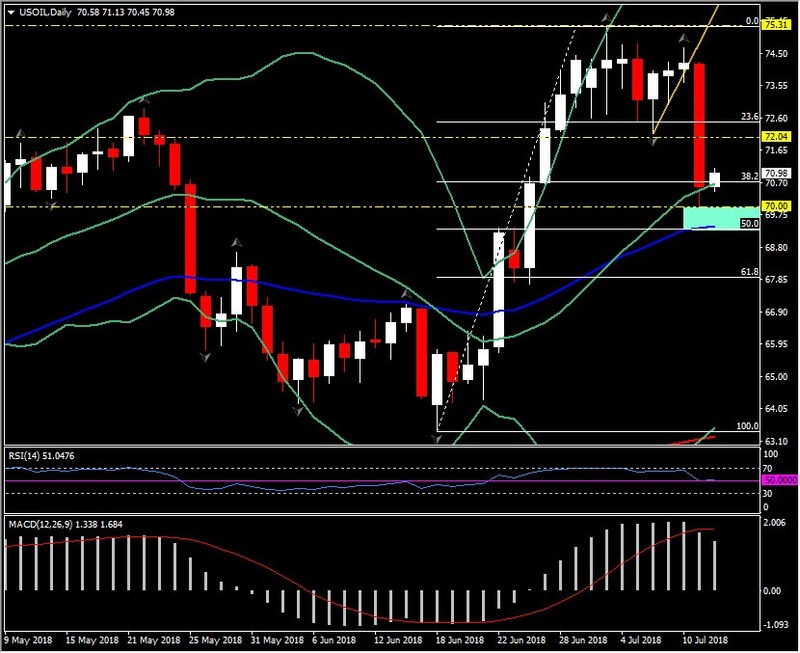 Therefore only a closure today below Support at $70 but most importantly below the $69.40, which is within the lower Bollinger bands pattern and the confluence of 50% Fib. level and 50-Day MA, could suggest further movement to the downside towards $67.00- $68.00 area ( latest up fractal – 61.8% Fib. level). To the upside only a recovery of the pair at least halfway of yesterday’s losses, i.e. 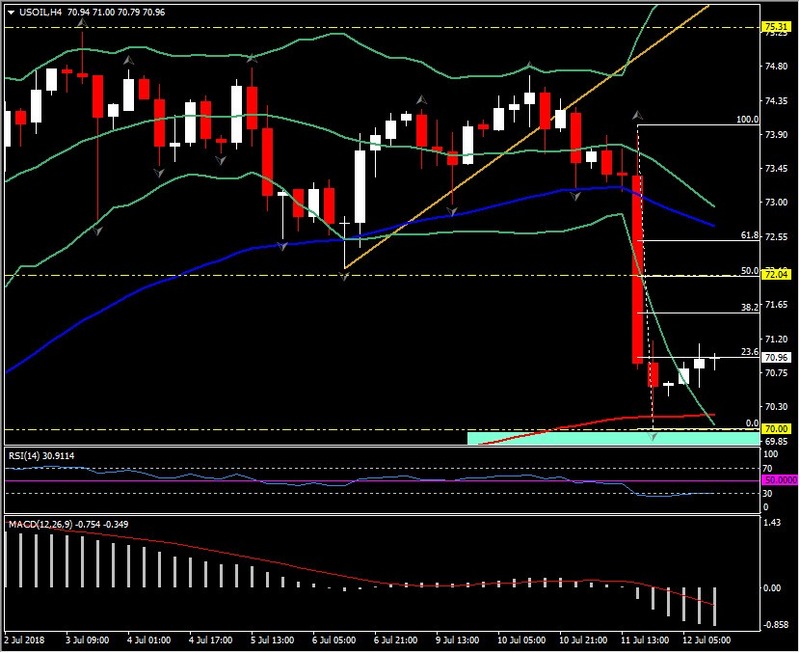 above $72.00, implies that bulls boost for the continuation of the uptrend for USOil. A break of $72.00 Resistance would open the way towards July’s highs, with next Resistance holding at $75.25.